Earlier this year, the students in our room transformed our Dramatic Centre into a Photography Studio and used our class iPad to capture stunning, one of a kind images from their unique lens of childhood. 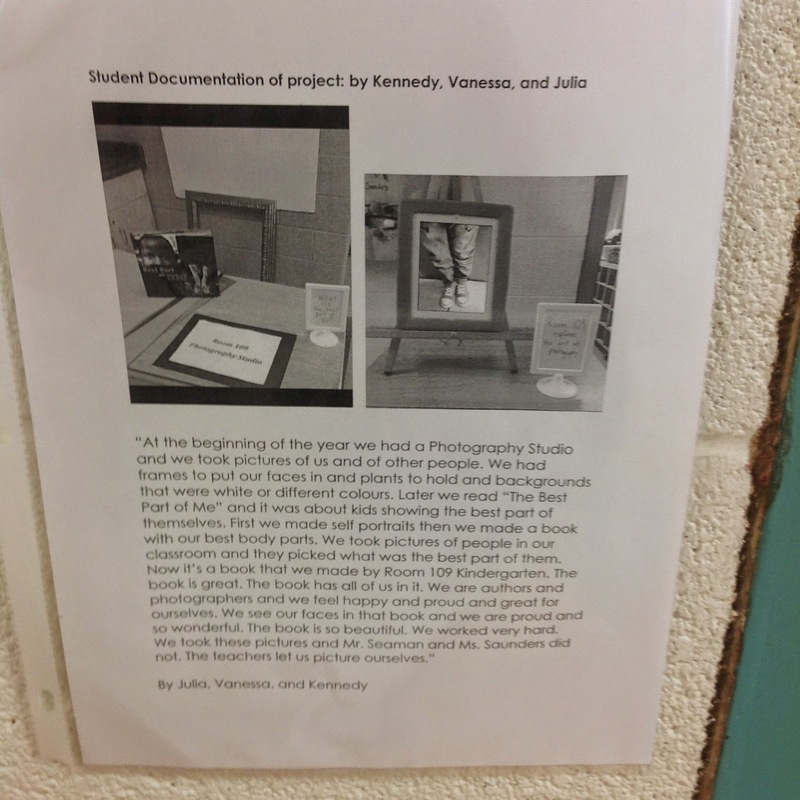 The original post detailing how this came to be, my thinking behind it, and what sort of student learning was demonstrated can be found here: The Photography Project: Honouring the Creative Spirit Over Crafts - check it out if you haven't yet! The original post was quite popular and a fair amount of readers asked if the project continued. This post serves as an update of how the interest of student photography has continued to unfold and evolve as the school year progresses. Initially, the Photography Centre was setup to capture child-initiated self portraits, but as their comfort with the iPad as a camera solidified, we observed students using it to take pictures of each other. 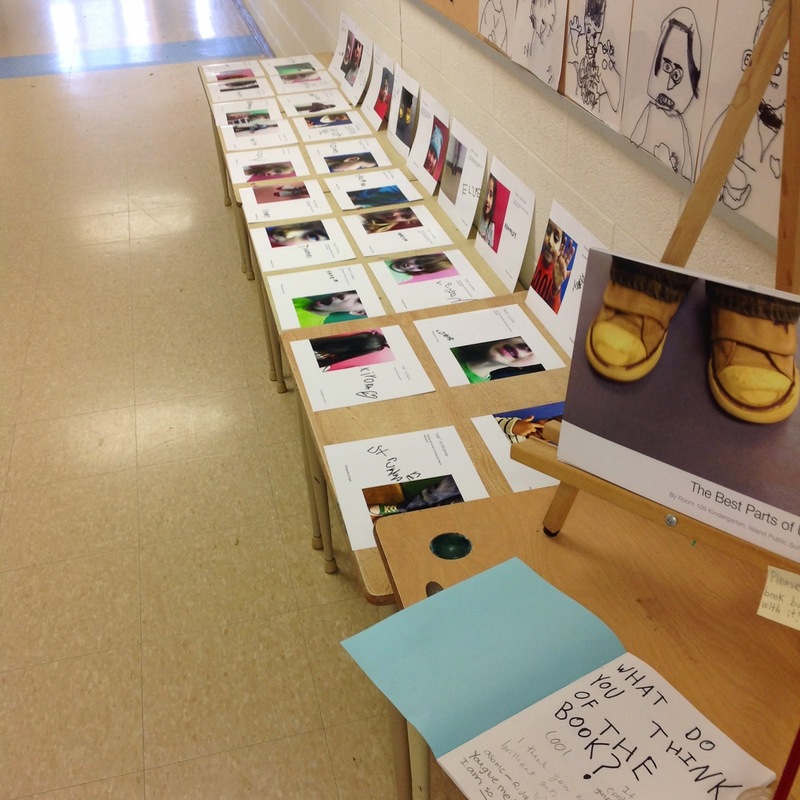 Along with this, we continued to explore photography books as a class, searching for inspiration in the art form. This led us to the fantastic book, The Best Part of Me, By Wendy Ewald. Our students connected to this book and couldn't stop talking about the photos and accompanying text. Their interest in delving into a similar exploration was electric. In partners or groups of 3, they worked together to determine what was their favourite part of themselves. Also choosing a colour background, they had their partner photograph the chosen part, framing the shot as they saw fit. Like the self portrait project, all creative choices were in the hands of the very capable students - we as educators simply stood back and let them be. After this, students were able to use their critical lens in going through all the shots and choosing the one they thought best captured what they wanted to say. Like in The Best Part of Me, students articulated why they chose the part they chose, and this was scribed by myself - reasons ranged from humourous, matter of fact, insightful, and even silly - all of them having the child's voice and personality coming through loud and clear. As I looked over the work captured through this process, I literally had my breath taken away. The images were stunning in every sense of the word. 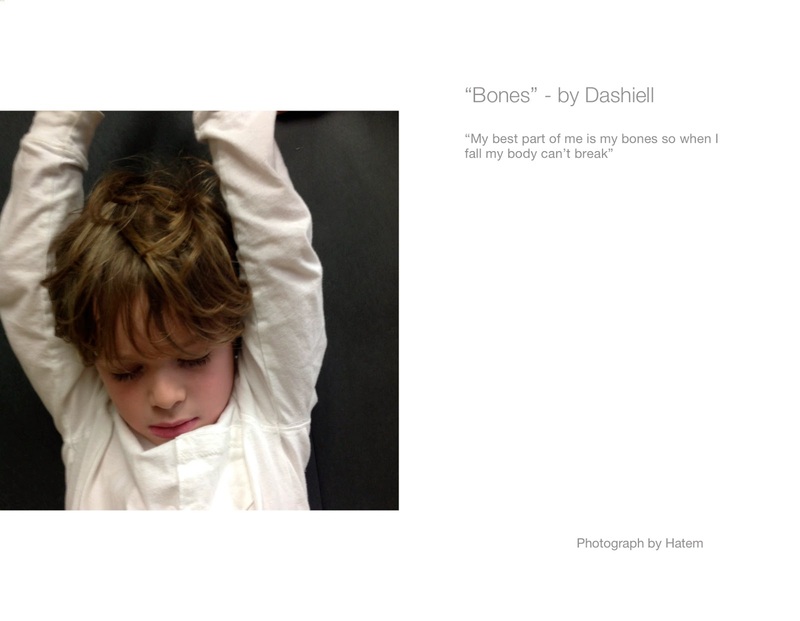 I knew we had to share them with a larger audience, and with the great Photo Book option on iPhoto, I was able to compile the students work into a beautiful book. Just this week we hosted our families for our official book launch, and I am so happy with how it was received - laughter, tears, and lots and lots of smiles! 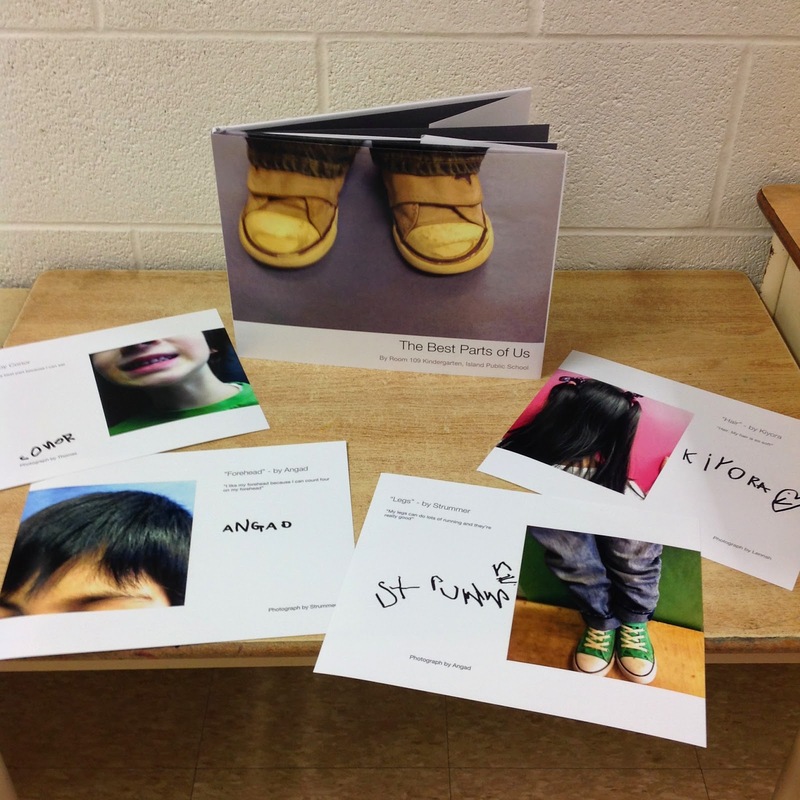 We also printed each page out and had the student author/photographer sign their autograph to it, which they were able to take home and hopefully frame as a memorable keepsake of what's been a major emerging focus of our year together. Of course, it's not really about the end product, but more so the process and journey that got us here, along with the skills developed along the way. Funnelling our student interest into this cumulative display has allowed me to present their hard work in a way that I believe honours and celebrates the depth of it. Looking through their photographs again and again, I am continuously wowed by the creative and artistic choices made by these young artists. It's a moment (of many) in which I consider myself very lucky to get to work with these incredible little human beings. I am so very proud of them all. Thank you for taking the time to read the post and to leave a comment. The initial interest seemed to emerge because students always saw me using the class iPad to document their learning through pictures and videos we share on our classroom Twitter. We are big on talking about how our iPad is a learning tool rather than something for games. After seeing me use the iPad in this way, students would openly ask to use the iPad themselves to take photos. Initially I felt a big uneasy, mostly because I was worried about the iPad being dropped/broken, but I gave my head a shake and reconnected with my belief that children are capable. We did talk about how to use it properly, but it also helped a lot that most of the students have held/used an iPad before in their homes and therefore had prior knowledge. Through class discussions the students wanted to use this new found interest in taking photographs to co-create a Photography Studio centre in our class. We worked together on researching what we needed, creating signs, and looking at other photographs for inspiration. A bit more info can be found in my initial photography post, linked at the start of this blog. Hope that helps!